Sometimes science can be stranger than fiction. But research in the early 70’s showed that we actually make new brain cells even after we have grown up. (the technical term is adult neurogenesis). How is this done? In animals you give them stuff called BRDU which gets in the DNA of the cells. Now a cell only makes new DNA once ie when it is forming. Therefore only those cells take up DNA which are being born. If you look for which cells have taken up BRDU you know these are the cells which have been born after you gave the BRDU to them. Does adult neurogenesis happen in humans at all? Can’t you give humans BRDU and see? Well no because BRDU is a mutagen. (causes mutations and therefore cancer). What would you do? Well, here comes the innovation that works around this problem. In the period from 1955-63 there were a lot of nuclear bombs being detonated above ground for “tests”. This lead to the C14 levels in the atmosphere going up. 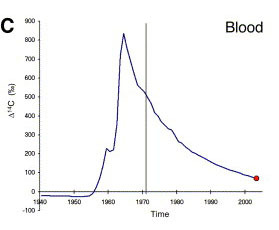 In fact it follows a pattern with the levels coming down exponentially after 1963 when the test ban treaty was signed. This is shown in this graph. These ratios of C14 to the normal level would be reflected in the DNA of the cell as well because the C14 is all over the atmosphere which would get into plants and therefore into human food as well. When a cell is born this C14 would go into the nucleus as well. If you could measure C14 levels in the cell DNA you could tell when it is born. You could do this for all the cells in body and determine the age of each groups of cells – like brain versus intestine. neat. Next big question – Did it work? Did they show that new neurons are born in the brain after birth? did they? did they? Well – short answer yes! The vetical line in the year of birth of the indivudual(~1973). The red dots represent the date of birth of the cells of the different organs. 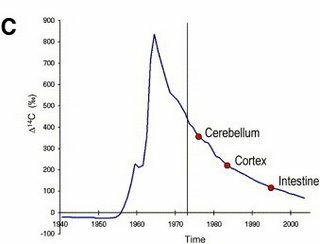 The intestine cells (also have high turnover rates like the skin cells) are the youngest having C14 levels corresponding to being born in ~1995 while the cerebellar cells are the oldest – being born in ~1975. The clincher here are the cortex cells being clearly born in 1982 or thereabouts, indicating clearly that new neuronal cells can be formed after birth. Who would ever have thought that nuclear bomb testing would have such a scientifically useful fallout (pardon the pun). And yes truth is stranger than fiction. For the ones who revel in the details here is the original paper. Just read on the BBC News site that an Indian mathematician, Dr. Sujatha Ramadorai of Tata Instititue of Fundamental Research has been awarded the Ramajuan Prize. She won it for her contributions to the ‘arithemetics of algebraic varieties and for her work on non-commutative Iwasawa theory‘. Congratulations doc! What’s not so nice is that TIFR’s website is so pathetic – no mention of Dr. Sujatha’s achievement, and absolutely nothing on her homepage. This is one reason why post-graduates here know close to nothing about research being done in this country. The only research you hear of, and that can excite you is what’s happening outside. And if you happen to be one who is keen on getting a PhD, (and are sensible), you would head west. Being in a quite optimistic mood today morning, I hope things will change, and soon. BTW, if any mathematicians read this post, could you translate Dr. Sujatha’s work in pop-science language?? High time I did post here, before more people start doubting my very existence. Had planned initially to blog on something else, but that didn’t happen. That’s a long story, and I will not repeat it here. As this is going to be an introductory post, I think I shall tell you about what I do. I work in a small bioinformatics based company in my hometown as a research associate. That’s my designation, although I don’t really do any research. What I do is ‘literature curation’ – a field which not many people in biology actually know off. What it involves is basically reading research papers, putting all that data together, and help improve biological databases. Once the data has been collated and meaningfully put together, it can be then used for finding drug targets, designing experiements, etc etc. This ‘collation’ of data can range from simple keyword/abstract indexing of papers to building signalling pathways in specific cell systems. Biocurators can be considered the museum catalogers of the Internet age: they turn inert and unidentifiable objects (now virtual) into a powerful exhibit from which we can all marvel and learn. That would be a decent enough contribution to the world of science, but the task of the biocurator is even more extensive. Computational biologists do not expect to merely walk through the door, cast a casual eye over the exhibit, and exit wiser (although we frequently do); we also want to add our own data to the exhibit, plus pick and choose pieces of it to take home and create new exhibits of our own. Oh, and we would like to do all these things with minimal effort, please. We can be a pretty exacting bunch of customers, and it takes skills over and above a knowledge of biology to juggle the different needs of data submitters, information seekers, and power players. This wonderful article gives a comprehensive description of a curator’s job while dealing with a (slightly) static database, while this one describes how data can be put together to create a (more dynamic) interaction database. If you’ve been following this blog for a bit you’ve obviously noticed the little strip of the latest PhD comics along the top. PhD Comics is written and drawn By Jorge Cham, a one time grad student at Stanford University and used to be published in their student newspaper but now appears in a number of newspapers across the US as well as on the web. Oh, did I mention there was a Matrix series too?